Part of this arc has already been set up by recent events in THE FLASH. Wally and Barry are having differences of opinion that are breaking out into open squabbles. Some of that is holdover from Barry’s poor choices during Grodd’s invasion of Central City. The rest is just the personality differences between the two, but it’s getting increasingly difficult for them to communicate well. The key thing from recent FLASH events is that Iris West killed Eobard Thawne in self defense, but in the 25th century that key part about self defense isn’t known. The reason? It’s the person in charge of the Temporal Courts, and we’ll get back to that soon. The Temporal Courts have sent the Renegades after Iris, to bring her back to the 25th century to stand trial. As a reminder, the Renegades are all patterned after our time period’s Rogues, though with some notable upgrade. Glider’s counterpart, Golden Guardian, is powered by a ring from the Sinestro Corps, for example. Barry and Wally have decidedly different ideas on how to deal with this group, with Barry wanting to reason things out and Wally wanting to take Iris on the run to protect her. In the end, Iris settles the debate. Wally is having more temporal seizures, and she believes a cure for him lies in the 25th century. She has no fear of defending herself, so all of the Flash team of the 21st century agree to go “back to the future” (with apologies for the pun). …and FLASH WAR is on! This is a GREAT start to the arc. We start to understand how simple differences of opinion can spiral out of control when loved ones are in danger. 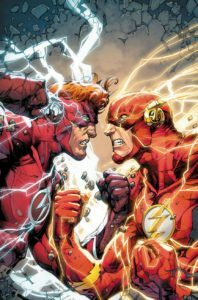 This split between Barry and Wally is being manipulated masterfully by Zolomon, and the kicker is giving Wally just enough of his former life to make him rush headlong into any scheme that will save them. I can buy into this battle, and it looks to be a potentially epic Flash tale. Just a word here – I grew up with Barry in the 1960s and 70s, but I have always been a fan of ALL the Flashes, from Jay to Barry to Wally to Bart. I don’t feel a need to personally choose between them. But, I know a lot of Flash fans that are strongly connected to one, almost to the exclusion of all others. THAT’s what makes this such a compelling story – we finally get to see how the two best-loved Flashes stack up when everything is on the line. So…grab some popcorn and settle in, this should be fun! Josh Williamson nails it with this intro to the arc, with fantastic artwork by Howard Porter. I loved seeing even the statues and busts of Max Mercury, Jesse Quick, Bart and more, and I can only hope that by the end of this arc we will see at least some of them return to active duty in the DCU. For now though, I’ll give this a 10/10! That’s my opinion – what do YOU think? Leave your comments below! That said, I have no issue with Barry, but was upset with the editorial mandate that shunted Wally West out of the frame completely. That looks like a great story that will hopefully lead to a Wally West monthly title too. That said, I’m looking for a total Speed Force victory here.